A commitment to quality and a desire to comply with the strictest global food safety standards led Bischofszell Food Limited (BINA) to implement a comprehensive food safety training programme. METTLER TOLEDO developed a bespoke plan for BINA, starting with Operator Training for metal detection systems. Susanne Mädrich, BINA's Group Leader Quality Management Process Safety felt it was important for all production line operators to understand the role they play in ensuring the 221,800 tonnes of food BINA produce annually meet the highest quality and safety standards. "Ultimately, we want to increase productivity on our 30 production lines," explained Mädrich, "but not at the expense of product safety. We wanted our operators to understand why they were testing for metal contamination, the influences on metal detector sensitivity and how to improve operator efficiency." How to comply with quality requirements. Phase 1 of BINA's plan focused on Operator Training on Metal Detection Principles for 65 line operators. This was delivered in four 1.5 hour sessions, spread over two days to minimize the impact on production capacity. Content was tailored to the food processor's needs, and involved a mix of instructor led training, case study videos and interactive discussions to test for understanding. Participants were highly engaged throughout the sessions, asking questions, and offering anecdotes about personal experiences. The classroom sessions provided an opportunity for knowledge sharing between colleagues with varying levels of experience. Joachim Gründing, Team Leader Quality Management Food Safety was very pleased with the level of participation and the active learning that took place during the courses. "After this session, I feel everyone has a much better understanding of metal detection - why it is so important to have metal detection systems, and the importance of testing our metal detectors correctly. 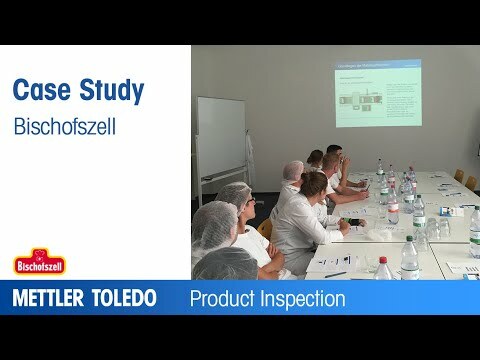 METTLER TOLEDO can keep your staff up to speed with the latest technical skills and knowledge, through in-depth training and learning.